Basketball can be the perfect sport for friends or families to play together. All you need is a hoop at the local school yard and an outdoor basketball. Outdoor basketballs have to be constructed differently than their indoor counterparts. Choosing an outdoor basketball may sound easy, but once you’ve considered size, brand, and colors you can easily be flooded with so many choices that you don’t know where to start. Outdoor basketballs face different challenges than an indoor ball. Rough pavement and weather can quickly wear through a basketball intended for the indoors. Outdoor basketballs also have to contend with the possibility of landing on rocks and bouncing through puddles yet retain their shape and maintain air pressure. There are several basketballs that stand out in design, functionality, and price. Once you’ve found the right basketball, you can play knowing that your ball will help you play your best. 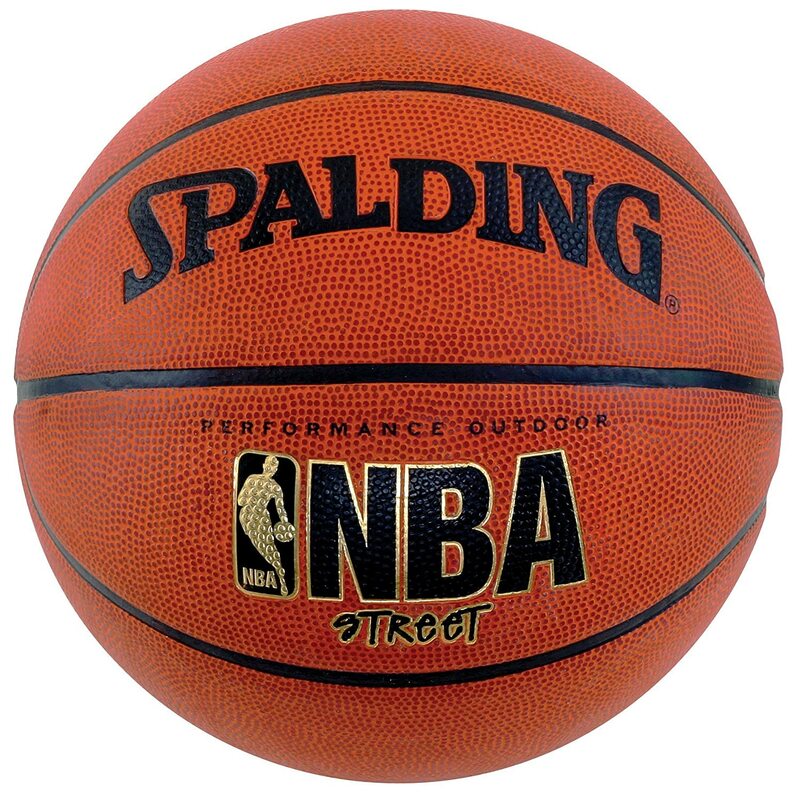 The Spalding NBA Street Basketball (Spalding) is designed to withstand the rough play of outdoor basketball. It is covered with an ultra-durable rubber. Rubber is crucial for an outdoor ball. When playing outside, the basketball may roll into puddles, mud, and dirt. Rubber can easily be cleaned and can withstand moisture. It also gives the ball good bounce. Outdoor basketballs quickly get covered with a fine layer of dust and dirt. This layer makes getting a good grip on the ball more difficult. The basketball can slip through fingers, causing mistakes or throwing off players shots. For this reason, outdoor basketballs are made with different groove levels to increase the ability of players to grip the ball. The Spalding is made with a wide channel grip design to enhance players’ ability while playing. Grip plays an important part in a player’s overall game. Passing speed, dribbling efficiency, and shooting ability can all be affected by the ability to get a good grip. Turnovers and rebounds also rely on a player’s ability to grab and hold onto the ball. A well-balanced basketball is also key to good play. The Spalding is well-rounded and holds its shape so that it bounces well on a variety of surfaces. These surfaces can change the way the ball returns to the players hand but with the right rubber, like that found on the Spalding, the ball can return with accuracy. The outer layer of the ball also must be able to withstand use on concrete, asphalt, and turf. These rough surfaces can change the surface of the ball, making it dull or leaving scratches. The Spalding has good, thick rubber that can take the rough wear of outdoor courts. High durability is another important feature for an outdoor basketball. Many outdoor basketballs require additional air after almost every use. This means you have to have a hand pump available at all times to make sure that your ball has enough air pressure. A game can be quickly derailed with a ball that keeps going flat. The Spalding holds air pressure well, making it convenient to use. Basketballs are made in several sizes. The Spalding comes in the three most popular sizes. Youth size 5, which is 27.5 inches around and weighs 17 ounces. This size works best for children and early teens. A smaller ball assures that young hands can still use the ball effectively. The Spalding also comes in an intermediate size 6, which has a circumference of 28.5 inches and weighs 20 ounces. This size works best for women’s play. Lastly, the size 7 official men’s sized ball with a circumference of 29.5 inches and weighing in at 22 ounces. 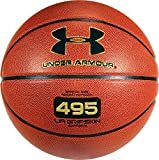 The Under Armour 495 Indoor/Outdoor Basketball (UA) is a quality basketball that can be used on indoor or outdoor surfaces. The durability of a basketball begins with the cover. The UA has a composite leather cover that provides a good, soft feel. 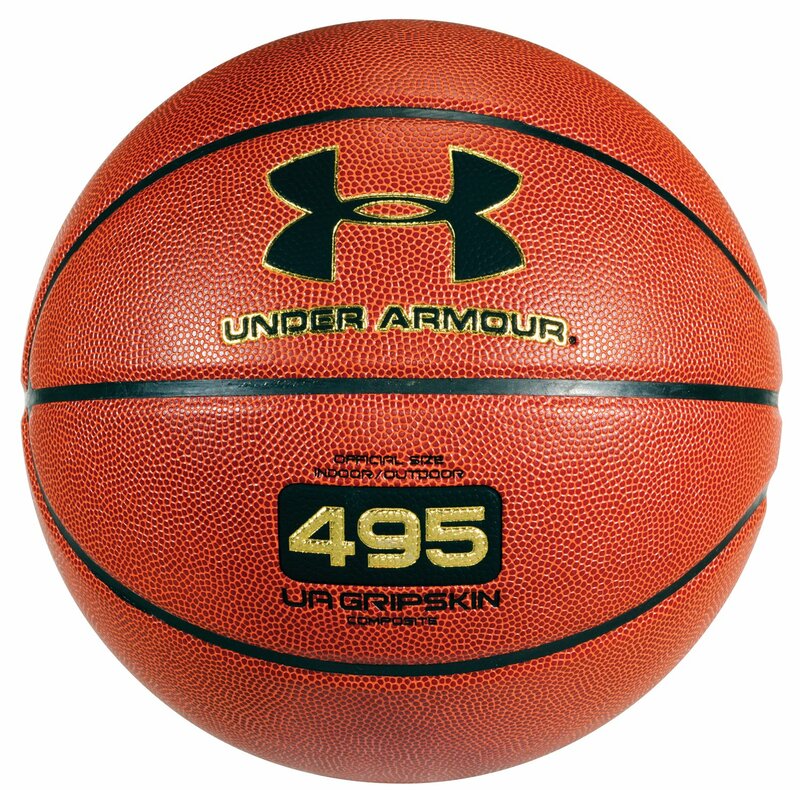 Basketballs that will be used both indoor and out tend to have less grip, which the UA does follow this pattern. However, it has UA Gripskin technology that helps players get a good hold of this ball despite shallower grooves than a ball intended strictly for outdoor use. Good grip is essential for quickly moving the ball down the floor. Accurate passing requires being able to move the ball from dribble to pass without fumbling the ball. Without good grip, the ball can slip, causing turnovers. Grip also comes into play when setting up to take a shot. Players require a strong, confident hold on the ball to set up the best possible shot angles. The channels on the UA are mid-range when it comes to depth, but are wide. Their wide width gives players more control over the ball when dribbling, passing, and shooting. The wide channels along with the Gripskin technology give this basketball a good texture that many players like. Outdoor basketballs tend to get beat up more than an indoor ball. A bad pass or bounce off the backboard can send the ball into rough and sharp debris. Retaining a well-rounded shape after this kind of use can be difficult. The UA has 80% nylon bindings that give it the ability to hold its shape even after repeated use. Good bindings can prevent bulges from forming on the basketball. Loss of air pressure is another issue that frequently comes up with outdoor basketballs. The rough nature of outdoor play can result in cracks and leaks in the cover and bladder of the basketball. To prevent air pressure loss the UA uses a 100% butyl bladder to maintain pressure. While having a hand pump is a good idea, when you use the UA you won’t need to pump up the ball each time you play with it. The UA comes in sizes 5, 6, and 7, which will work for youth, women, or men. The Baden Contender Outdoor Composite Basketball (Contender) has the features needed for indoor or outdoor play. The Contender has a composite leather cover that responds well to indoor courts but is tough enough to hold up to outdoor play. The composite leather found in the Contender can handle the rough texture of the concrete or asphalt commonly found on outdoor courts. These surfaces respond differently than an indoor court. A good composite, like the one found on the Contender, can compensate for the differences of the court materials, providing good bounce wherever it is used. The Contender has a wide panel design and deep channels to give it good grip. When playing outside, losing hold of the ball can easily happen because the ball and players’ hands get covered in a fine layer of dirt and dust. Deep channels between the panels of the Contender allow players to hang on to the ball despite these challenges. The surface of an outdoor basketball also has to have a good amount of texture, like the Contender, to be used for reliable outdoor play. Indoor/outdoor combination basketballs have a softer texture than basketballs intended only for outdoor use. 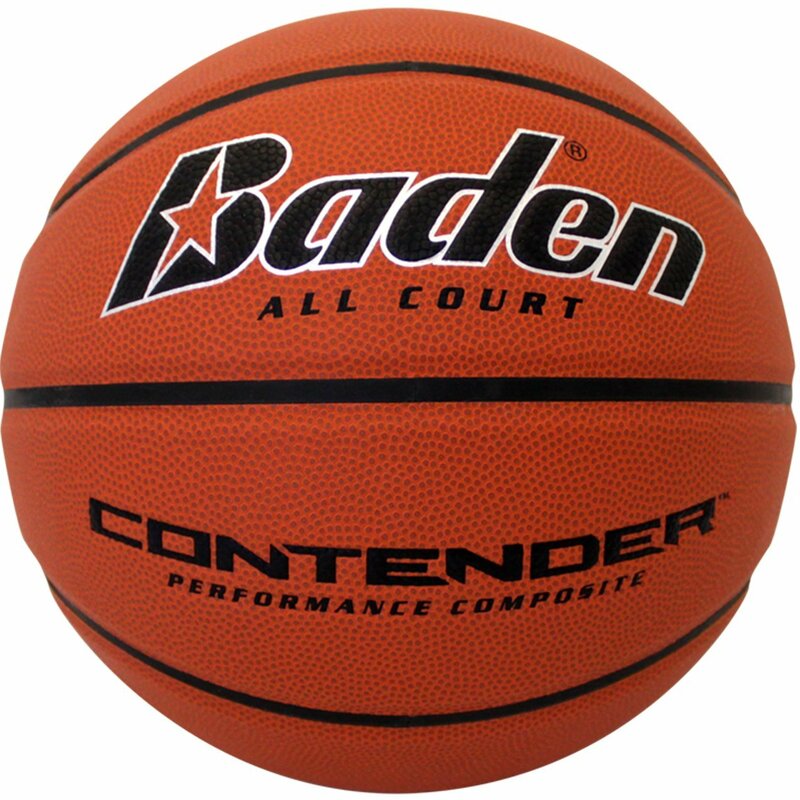 The Contender has this soft, textured feel that many players often associate with indoor basketballs. The softness allows fingertips to grip into the cover of the ball. The Contender has a Stealth Soft-Valve System that uses less exposed rubber around the valve. When the basketball hits the ground on the valve, if they valve protrudes, it can cause the basketball to head off in an unpredictable direction. Bouncing on the vulnerable valve area can also cause the valve to puncture the ball. The system used in the Contender hides the valve and reduces the chances of this extra rubber affecting the bounce of the ball. Symmetrical design is used to give good bounce and accuracy. When a basketball begins to degrade, the shape can change and make for unpredictable bounces. A basketball has to be able to hold its shape without defects or bulges forming. This basketball performs well and holds its shape over time. The Contender comes in five color combinations, which gives you more options than some of the basketballs that have been reviewed. You can choose your team colors or a color combination that will make it easy to see from anywhere on the court. The various colors are only available in in sizes 5 (youth) and 7 (mens). The Wilson Killer Crossover Basketball (Crossover) has the traditional look and feel of an outdoor basketball. The familiar dual color panels are a traditional look that set outdoor basketballs apart from the indoor brown leather basketballs. The Crossover uses an optima rubber cover that provides good bounce and grip. For outdoor play, rubber offers the best grip. With pebbled texturing, it can give players’ hands the necessary grip despite the dirt on the ball. The texturing and rubber together can compensate for a wet or dirty ball. Rubber is a superior option for outdoor balls because it can also withstand moisture. Puddles and mud are hazards of playing in the outdoors. You don’t want to have to quit your game or clean the ball because it rolled through a puddle. With rubber, play can continue no matter what the court or weather conditions. Rubber basketballs also work well for youth. Youth that are learning to the play the game often need a little extra help keeping their grip on the ball. When learning to pass, dribble and shoot, a basketball that practically sticks to your hand will help in the learning process. The Crossover also works well for youth because if it gets left outside in inclement weather, the ball is not going to get ruined. The Crossover comes in five different color combinations and three different sizes. Not all colors are available in all sizes. Channels are the seams between the panels of the basketball. Channel depth is a good indicator of the quality of an outdoor ball. Deep, wide channels allow for the best grip of the basketball. Good grip is essential for any basketball, especially in the outdoors because the ball is harder to hold onto in outside conditions. Dirt on the ball, dirt on hands, water from puddles can all make gripping the ball more difficult. Pebbling is the texture on the cover of the ball. 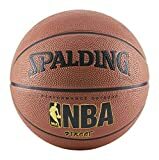 All basketballs have some degree of pebbling but outdoor basketballs have more pronounced pebbling that an indoor basketball. In fact, the pebbling on some outdoor basketballs is quite pronounced, creating tiny ridges all over the ball. Pebbling provides better grip on the ball for players when dribbling, passing and shooting. It also allows the ball to grip the court when bounced. Maintaining air pressure can become a challenge in outdoor basketballs. Outdoor basketballs face more rugged conditions. When playing outside, the basketball can end up bouncing over rocks, sticks, and even under cars. Keeping the right air pressure under those conditions requires a good bladder to hold the airtight within the basketball. The valve area must also be thoroughly secured with rubber and with the valve itself being properly inserted into the basketball. If the valve sticks out further than the cover of the basketball, it poses a risk of puncturing the bladder when bounced. A basketball that has lost its shape is useless. Look for a ball that starts out perfectly round. Some balls have special features to help the basketball maintain its shape, such as nylon cording woven in the bladder. Without adequate protection, the wall of the bladder can get punctured without an outward sign on the cover of the basketball. The result is a bulge. Once this happens the basketball has to be thrown away. The cover of the basketball plays an important role in the protection of the bladder, grip for the player, and ability to withstand outdoor conditions. There are two basic types of covers for outdoor basketballs. Rubber is usually used on basketballs that are meant to be used exclusively outside. They can be made to look like a leather basketball or can be brightly colored. Rubber is rough on the hands but provides good grip. The rubber resists water and dirt well and can stand up to concrete, asphalt, and turf courts. Composite leather looks and feels the most like natural leather but can better handle rough and tumble outdoor play. It tends to be softer than rubber, making it easier on players’ hands. The softness also allows players fingertips to get a good grip on the basketball. Most composite basketballs have more pebbling than a natural leather ball to increase their gripping properties. 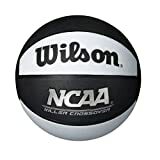 Many composite basketballs are considered an indoor/outdoor basketball. If you plan to use your basketball in both types of courts, an outdoor basketball with a composite leather cover would work best. As you begin to narrow down your search for the right basketball, keep in mind the kind of court that you will be playing on most. The rougher the surface, the more rugged and durable the cover of your basketball will need to be. The important thing is to have a ball in the right size that you can trust to maintain air pressure and provide good grip. When you have those things, you’ll be able to head out for a day of basketball and not worry about your basketball losing air or keeping you from playing your best.